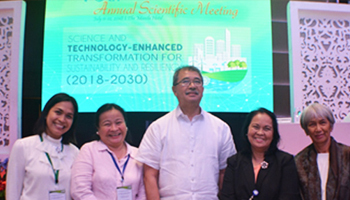 Misamis University is among the higher academic institutions in the Philippines whose academicians presented during the National Academy of Science and Technology, Philippines (NAST PHL)- 40th Annual Scientific Meeting (ASM) on July 11-12, 2018 at the Manila Hotel with the theme "Science and Technology-Enhanced Transformation for Sustainability and Resiliency 2018-2030". The Annual Scientific Meeting of the NAST PHL serves as the leading convention and platform for the Science and Technology experts from the academe, industry and policy-making agencies of the country to exchange ideas, transform research results into programs for the production of commercial products in the future. From more than 400 research papers submitted, the review committee chose only 262 studies, of which 5 research papers from Misamis University were included. During the scientific poster session, the Adopt-an-Estero Program: The Misamis University Experience was presented by EnP Grace V. Villanueva, Director of Misamis University Community Extension Program and Faculty of Graduate School. The Establishment of Seed Production Areas in the Province of Lanao Del Norte was presented by For. Engr. Alfredo F. Garrido Jr., a faculty of the College of Agriculture and Forestry. The Diversity of Birds on Mt. Malindang Range Natural Park (MMRNP)-Hoyohoy Site, Tangub City was presented by Yunalyn Labajo-Villantes, faculty of Natural Science Department-College of Arts and Sciences and staff researcher of Misamis University Community Extension Program. The study on Basic Oral Health Care Knowledge of Primary Health Workers Appraisal: Basis for Misamis University College of Dentistry Oral Health Education Program was presented by Dr. Myles Lasutaz-Pusod, faculty member of the College of Dentistry. Lastly, the Species Richness, Endemism and Threatened Amphibians and Reptiles on Mt. Malindang Range Natural Park (MMRNP)-Hoyohoy Site was presented by Mark Anthony Manapsal, a Laboratory Technician of the Natural Science Department- College of Arts and Sciences. The attendance of the MU faculty and staff to the NAST PHL Annual Scientific Meeting gave them the opportunity to meet National Scientists and Academicians from different Science and Technology sectors in the country. It allowed them to talk and discuss with experts for possible collaboration and partnership . This participation was made possible with the approval and support of the Misamis University administration and management led by President Dr. Karen Belina F. De Leon. Above, from the right: Mark Anthony Manapsal, For. Engr. Alfredo F. Garrido Jr., National Scientist Dolores Ramirez, EnP Grace V. Villanueva, Dr. Myles Lasutaz-Pusod and Asst. Prof. Yunalyn Labajo Villantes. Above, from the right: Academician Jurgenne H. Primavera, NAST President- Academician Rhodora V. Azanza, DOST Secretary Fortunato de la Peña, EnP Grace V. Villanueva and Asst. Prof. Yunalyn Labajo-Villantes. Above, EnP Grace V. Villanueva, MUCEP Director and Asst. Prof. Yunalyn Labajo-Villantes in serious discussion with newly appointed NAST member, Academician Victor Amoroso about flora and fauna identification and verification collaboration. Below, some of the NAST participants viewing the MU poster presentations..